One of the best and most beautiful expressions of Mughal culture is its gardens. Sadly, few examples survive, but among the finest are the terraced gardens in the Kashmir valley. On a visit earlier this month I saw how these exquisite sites are being restored to something approaching their seventeenth-century glory. Dr Jan Haenraets, an expert on the restoration of historic landscapes, is advising on the work in Kashmir and I am delighted that he has agreed to be interviewed here. View from the black pavilion at Shalimar Bagh. Jan, what makes the Mughal gardens of Kashmir so important? First, they are just exceptionally beautiful. They also provide irreplaceable physical evidence that helps us understand Mughal – and Mughal garden – history. 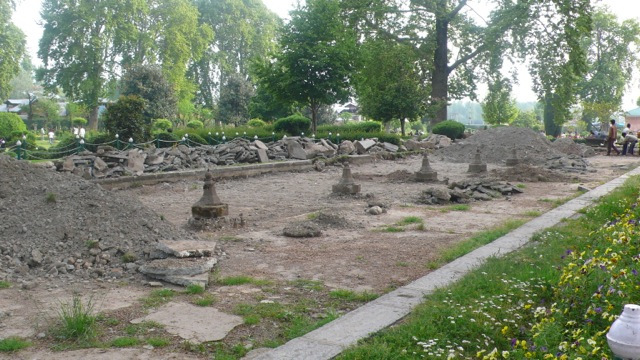 People think of the great garden tombs such as the Taj Mahal when they think of Mughal garden history, but in Kashmir the gardens were created just as gardens, not to accompany a tomb. The mountainous topography also produced a specific type of design – the terraced garden. 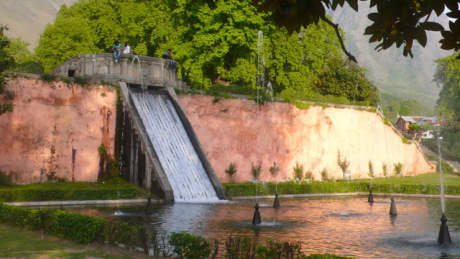 It feels as if Kashmir was the ultimate gardening playground of the Mughal Emperors; indeed it is said that, during the height of Mughal glory in the mid-17th century of Shah Jahan’s rule, the Kashmiri city of Srinagar boasted around 700 gardens. They also represent a pinnacle in the long gardening tradition of Kashmir, although the horticultural influence from Kashmir on the Mughal tradition still needs much research. When I think of the Kashmir gardens, places like Kyoto, Japan and Suzhou, China, come to my mind. Both places are recognized as UNESCO World Heritage sites, with dense numbers of gardens playing a key role in these UNESCO listings. 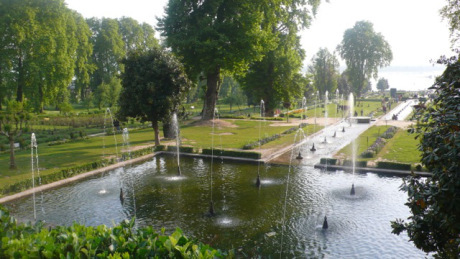 The Mughal gardens heritage of Kashmir is, in my opinion, of no lesser significance. For me, they are one of the peaks of Islamic garden art. How did you get involved in the project to restore them? 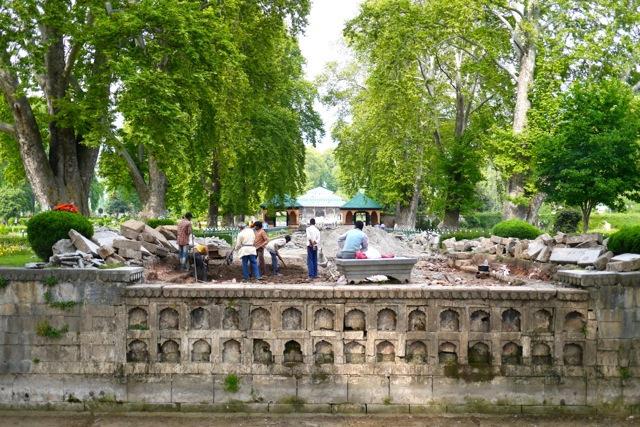 I had been aware of some ongoing conservation planning for the Mughal gardens in Kashmir since 2004, when the Jammu and Kashmir chapter of INTACH [the Indian National Trust for Art and Cultural Heritage] started their first management planning surveys. In 2010 I had the chance to help for some months on additional research and management recommendations. The INTACH J&K team wanted some expert advice to help with more detail, especially in relation to the horticultural and soft landscape aspects, as their expertise was mainly architectural conservation. What state were the gardens in when you first got involved? The gardens were managed and open to public, with many people visiting, mainly locals and Indian tourists. 2010 was a turbulent summer in Kashmir, with almost three months of strikes, daytime curfews and protests in the valley, meaning that places were closed down most of the season. Although by 2010 INTACH J&K had already started some architectural conservation works, they stopped when unrest occurred. At Achabal Bagh the central water channel and pools had been repaired, with work ongoing on the main baradari [pavilion] and the side channels. In Shalimar Bagh and Nishat Bagh work had started on the water features and, although it was not complete, they were working. The main work in these two gardens was on some of the buildings, including the hammam in Shalimar Bagh and the baradari in the Zenana at Nishat Bagh. What has now been achieved? INTACH J&K continues step by step to restore architectural features. The Department of Floriculture maintains the gardens, and aims to keep the key six gardens presentable. 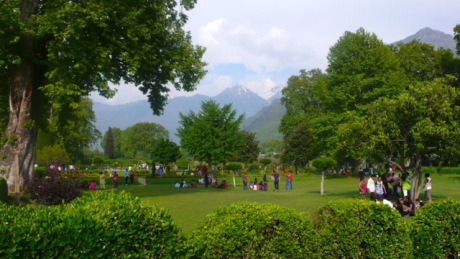 The fine plane trees and mountain views at Shalimar Bagh. One success was that we managed to get the key gardens [Nishat Bagh, Shalimar Bagh, Achabal Bagh, Chashma Shahi, Pari Mahal and Verinag] as a serial nomination onto the Tentative List for UNESCO World Heritage. Now we are developing a project that hopefully can result in a holistic conservation approach. It feels like now the gardens have largely been stabilized, with architectural features being partly restored, but with the real challenges only starting. The main focus now must shift towards the wider gardens and landscapes. The management so far has focused on the central channel areas only, and so the wider landscape features are frequently damaged and much at risk. Most visitors only see the central parts of the gardens for a short time, and enjoy that. But mostly they do not realize the layout and importance of the wider gardens and landscape. For instance the Shalimar canal between the garden and Dal Lake is of key significance, but is in a dire state. The surrounding cultural landscape and the lake are also at risk. Restoration work in the water channel above one of the chadar at Shalimar, May 2013. The water channel and fountains on a higher terrace at Shalimar, undergoing restoration, May 2013. The Department of Floriculture needs to be more skilled at managing heritage gardens, rather than presenting them in a typical urban park style. Plus, maintenance needs to be better, to tackle the wear and tear in the gardens from visitor pressure, with for instance lawns compacted and central parts in a poor state, and the less-known gardens generally need more maintenance. Horticulture and planting schemes need to improve in the gardens: for instance there used to be many orchards on the terraced side wings of the gardens, but little remains of these plantings. We basically need now to develop actions such as archaeology, conservation propagation, interpretation, conservation skills training, restoration planting schemes, legal protection, a Kashmir Mughal gardens database and buffer zone protection. 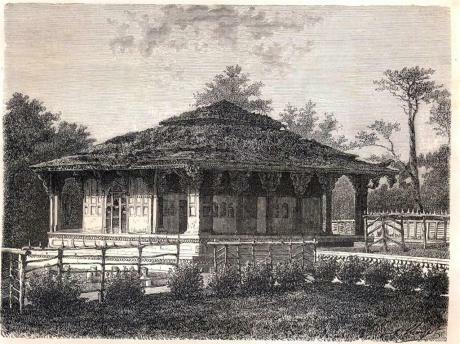 Drawing of pavilion at Shalimar Bagh, 1870. Which is your favourite of the six gardens? and why? All the main gardens have something very special. I believe that for instance Shalimar Bagh should be seen as a ‘cultural landscape’ – different periods of history have created historical layers in the garden with distinct markings, and its wider setting and features are amazing. 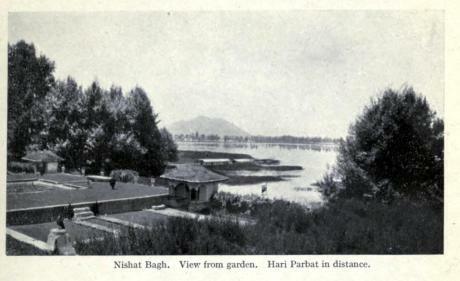 If I must highlight one garden, then maybe I’d say Nishat Bagh because its terraces are so extensive. Most visitors only see the central axis, but the ‘side wings’ in Nishat are incredible. I don’t feel that anyone truly recognizes the sophistication of these terraces, and how ingenious the making of them must have been in Mughal times. Remember that there used to be over 700 Mughal gardens in Kashmir; today we speak often about the six main ones that are open to the public. Just to illustrate, I’ll mention a seventh, and that is Jharoka Bagh at Manasbal Lake. It also is struggling conservation-wise, but still worth a visit. Its location on a hillside next to the lake makes beautiful use of the genius loci. Old postcard showing the ruins of Pari Mahal. What has been the biggest challenge in the project? Convincing the management authorities of the need to have a conservation management approach and stop the ongoing damaging developments. Awareness remains low and it is hard to see people put much time into the safeguarding of the project while damage continues to occur. And what is the greatest joy? Doing so much work on the historical survey, sometimes the greatest joy lies in finding that one new previously unknown photograph, to experience how we slowly start to understand the gardens. For instance, when I gave a talk in London about the gardens, someone had brought to the lecture unseen early 20th century photographs that his mother had made of the gardens. That often is what keeps the motivation alive. In the gardens there is also always joy to experience. For instance just watching the local kids play cricket in the Zenana under the ancient Chinar trees is fantastic, or strolling through the gardens and being offered fresh berries or fruit from the garden by the locals. With many thanks to Dr Jan Haenraets for this interview. 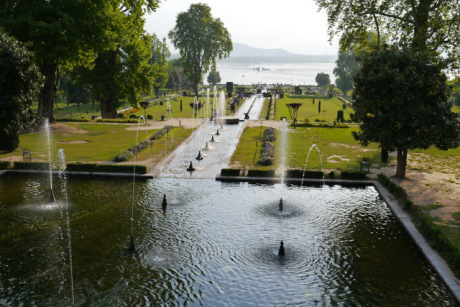 For more on the Mughal gardens in Kashmir, see Jan’s article here and the UNESCO World Heritage entry here. 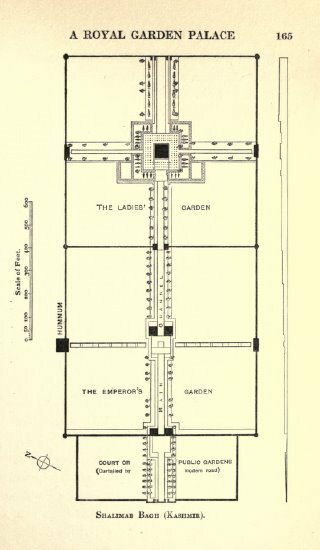 Plan of Shalimar Bagh, 1913.